Want to work in a great cultural city for a growing communications agency? Kelly Pepworth, managing director at Speed Communications in Bristol, tells PRWeek Jobs what it's like to work there. The chances are – if the headline caught your attention and you’re reading this – that you’ve already wondered about what a life in Bristol might be like. Perhaps you’ve only got as far as the odd daydream about settling in the South West. Or maybe you’re a little further down the line and you’ve already put the accommodation or employment wheels in motion. Whatever the stage of your escape impulse, as a thriving, ambitious and rapidly expanding Bristol-based communications agency, we’d love to hear from you. But we understand that a big decision like this can’t be made on a whim. So, let us tell you a little bit more about Bristol’s credentials and what makes it such a special place to live and work. First of all, it’s lauded for its distinctive identity, rich cultural heritage and commitment to nurturing creativity. With its world-class art and music scene and dedication to environmentalism and sustainable living – which saw it crowned European Green Capital status in 2015 – the city often gains recognition on the world stage. In fact, it was placed fourth in the 2016 World’s most inspiring cities listing. It’s also something of a powerhouse in the national economy stakes, being a fertile ground for established firms and startups. Employment figures are well above the national average and the general expectation is that Bristol will be one of the fastest growing UK cities over the next three years. This attracts a diverse and dynamic workforce of highly skilled and creative people from across the UK who want to live in a great cultural city and work with exciting national and international brands. We have seen a wave of talent migrating from London and other major cities as a result of this. The PR and marketing industry itself is flourishing in the region, from start-ups and specialist independents to in-house teams and a burgeoning freelance market. "One of the most exciting and energetic places in the country"
Those of us who already live in Bristol were very proud when it was crowned the 2017 Sunday Times best place to live in the UK. Citing its excellent location "handily placed for seaside and scenery, but hardly cut off from the rest of the country" and diverse range of jobs "lots of them glamorous, creative, hi-tech and professional" the wise panel of experts also gave a big thumbs up to the incredible range of food and drink establishments. It may have been de-throned in 2018 (got to share the love) but the Sunday paper did conclude that it still "remains one of the most exciting and energetic places in the country." Right now, we’re looking for an account director within our B2B & corporate team. If you’re a seasoned pro at stakeholder engagement, positioning and delivering outstanding multi-channel content with expert media handling skills and a natural ability to build strong relationships and gain trust, then this could be just the role for you. As we continue to grow we’re always on the lookout for new people to bring their passion and energy to the team. Join us and from the start you’ll have the opportunity to work across some amazing clients, ranging from big-name brands to exciting start-ups. 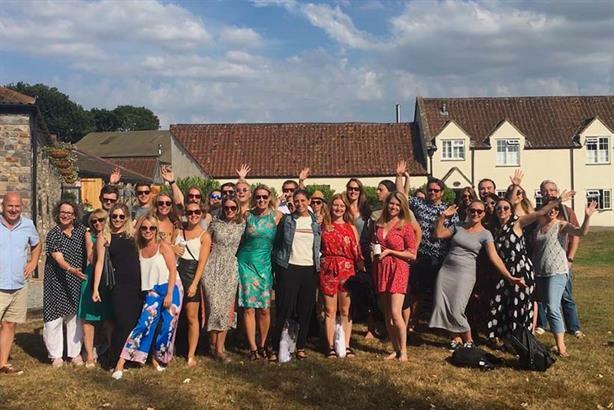 We’re the largest PR and communications agency in the South West, in fact we were recently awarded ‘Large consultancy of the year’ by PRCA Dare. We’re also part of the mission, an international marketing, technology and communications group made up of 16 agencies and over 1,000 employees. Our scale means that we can invest heavily in your professional growth so that you can excel in your career. We help people reach their full potential through education, skills training, teamwork and individual coaching – all within a supportive and fun environment. You could soon be working with a 50-strong team of some of the most talented, dedicated and passionate people in the business. People are integral to our success and because of this, we focus on keeping them happy and healthy. This is reflected in all the great stuff we’ve created for the team from long service awards, healthcare plans and enviable holiday allowances. Ours is a culture where everyone belongs and where openness, diverse thinking, experiences and backgrounds are truly valued. So take a leap of faith, find out more and you too could soon be waxing lyrical about the wonderful city that is Bristol. Find out more and apply for the account director role at Speed Communications on PRWeek Jobs, the specialist job board for the PR and communications industry.